Your love for the pool is your best motivator for playing it well. Twenty minutes of thoughtful practice beats four hours of banging balls around. Practice may not turn you into a great player, but without it you don’t even stand a chance. Instructional books are a bargain compared with the price of experience. The cost of a book could easily be recovered in your next competitive event. No advice is better than bad advice. Be patient and learn pool’s various skills in the proper sequence. Every edge gives you another way to win – and to avoid losing. English is useful tool, but it is not the secret to pool. You can live with unique quirks in your game, but bad habits must be eliminated. Change often leads to improvement, but does not guarantee it. An ongoing quest for knowledge insures your enthusiasm for pool. Knowing your game enables you to quickly cure your common faults and to avoid slumps. Pool’s big secret is that there is no big secret!!! Your game could take a quantum leap at any moment, so be ready to embrace your higher level of play when it happens. A new secret could be the one that unleashes the full power of the 1,000’s of secrets that you’ve already accumulated. When your practice game, home-room game, and road games are equal in quality, you have arrived as a competitor. If your go against your basic nature – your game will suffer 9 times out of 10. As your game improves, it takes more time for its upkeep. Shotmaking showoffs and winners are seldom the same player. Consistency is a function of the quality of your fundamentals. Your game and results may not be closely correlated in the short run, but in the long-run they are completely related. The quicker you recover from a poor shot, the less impact it will have on your match. Your game is only as strong as your memory. Your true game is the one that matches reality with your perception of reality. To find out how well you play, compete against several players with rankings near your level of skill. Once you get hooked on Straight Pool, the more balls you run, the more you’ll want to run. Over-reliance on a strength turns it into a weakness. The balls never lie, so if you often question their actions, you lack knowledge of pool’s physics. Your winning percentage reveals your desire for competition, sportsmanship, emotional makeup, and love of money. Compete mostly with players a little worse to a little better than yourself. Your opponent may know your game even if you’ve never played each other. Better players can size up a table fast, even in the same room when some might assume that the tables are all alike. When under pressure, you’ll play better or worse than your “average” game. If you’ve got heart, you’ve got a chance. Concentrating 100% on the shot at hand produces the best results, so think about nothing but that shot. Dead stroke comes when not trying after much trying. When it’s only you and the table, you are at one with the game. Confidence and skill are linked together. Believe that you will play well until you do play well. Confidence doesn’t guarantee results but rather the best that your game has to offer. If you don’t believe in your game, who will? Your anger is excessive if it causes one more mistake. The art of playing badly well is the key to consistency. Every shot provides information that can help you to improve. Time spent wisely in the chair can help you to win. It is not about those negative outside forces, but rather your reaction or lack of a reaction to them. Don’t let your opponent’s strong play surprise you. When your opponent sharks you, it’s because he doesn’t think he can beat you with his game. There is so much more to pool than shooting straight, playing shape and blasting a rack into pieces. When you break down, the contest is over before it is over. Under extreme pressure your hearing gets better or worse. Don’t worry about the outcome of a match and it will more likely turn out the way you want it to. Winning leads to more winning if you believe and then let it happen. After some losses it is not over when it’s over. Defeats offer lessons that can help you improve your game. You can win without winning. You don’t have to be the best player or to be on top of your game to win tournaments. The better you play the fewer rolls you need. If you expect bad rolls you won’t be disappointed. Mistakes are under your control but the rolls are not, so why worry about them? If you put up money before a competition in the hopes of increasing it, then you are gambling. The person giving the spot wins more often than not. 50 percent of all money matches are over before they have begun. The more weight you think you need, the more weight you really need. The nuts is not always the nuts. Your tempo affects your time of possession and your ability to play your best game. League pool combines the best of individual sports with the virtues of team play to create something special. Winning is more satisfying in a league where the competition is stiff. Team goals take precedence over individual goals. Imagine your team’s season before it begins, then make that vision a reality. League pool is largely about helping each other grow as players. Your reputation speaks before you enter a poolroom. Life is short, so don’t waste it playing jerks. Pool offers participants the ultimate combination of physical and mental skills. Pool can be played by those from 9 to 90. Asking questions about your game will improve your journey. The only constant about your game is change. Your laws for your game and life reveal your character, so choose them wisely. The acid test of your home room is how you feel while you’re there. Every room is to be valued for its contribution to your experiences. When you can no longer out shoot your opponents, outsmart ‘em. When age has taken your game, it’s time to help others find theirs. 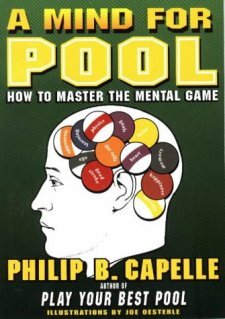 There is much to love about pool, so don’t to waste time on the negatives. The better a player talks pool, the tighter you should hold onto your wallet. Each of us acts like a child once in awhile, so we should occasionally try playing pool like one. When pool’s no longer fun, you only have yourself to blame. The memory of a great shot brings pleasure for years to come. Learning a new game can lead to improvement in your other games. Playing several games on a regular basis will increase your enjoyment and knowledge. A break from pool should restore your zest for the sport, but not be so long that your game suffers much. Every fine shot radiates the magic and beauty of the game. Great players’ possess a complete package of skills, each honed to a razor sharp edge. Being pool smart is a special kind of intelligence that should not be underestimated. Old timers played 50 percent better than they really did now they no longer are expected to prove it on the table. Highly skilled psychologists are known to hang out in pool rooms. Pool can bring a child much joy and lead to much personal growth. Without the rogues of pool, the game would lose much of its color. Rogues’ poor behavior makes the rest of us look better than we are.